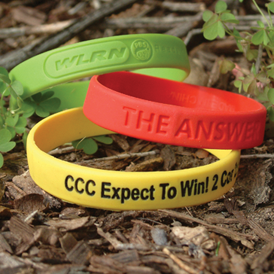 In July 2004 BizPins was the first supplier to come out with the industry first wristband, the Hope, Courage, Bravery, and Endurance design which was first shown at the SAAC Show in August, 2004. We have sold and continue to sell only one level of quality the highest! Debossed area: 3/8" H x 7-1/2" W.
RECYCLED silicone, Debossed. Made using recycled silicone and has a 4 week production time. For Multi color bands add 0.10 (C) for each additional color. 4 weeks from approval of paper proof or pre production sample.